Here are our two new commercials! We run these on our website, facebook, and ran them on local TV. These aired on select networks in the Sierra Vista, Fort Huachuca, and Benson Area. We are excited to bring something fun and funny to help get the word out about Hoppin' Grapes Wine and Beer Bar Sierra Vista. We opened in December of 2013 and still notice many people in the area haven't heard about us. We are trying to change that! Check out our facebook page for more info on our hours of operation, specials, and more. In the above commercial, Kristine pulls up in her car and asks Eric (dressed as grapes) to "Hop in.. Grapes". Next we try to showcase some of our beer, wine and fin for a great bar Sierra Vista. 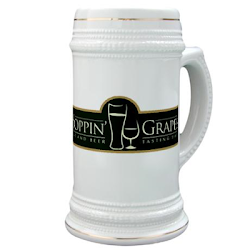 Hoppin' Grapes has always tried to bring a little class to a bar in Sierra Vista, without being pretentious. Hoppn' Grapes at 409 West Fry BLVD in Sierra Vista, Arizona across the street from the Landmark Cafe. We are a great bar Sierra Vista offering beer and wine with tastings daily. In the next commercial, Donna and Kit conduct a "news" interview with Eric (dressed as grapes) hopping around in the background. Next we try to showcase some of our beer, wine and fin for a great bar Sierra Vista. Hoppin' Grapes has always tried to bring a little class to a bar in Sierra Vista, without being pretentious. Hoppn' Grapes at 409 West Fry BLVD in Sierra Vista, Arizona across the street from the Landmark Cafe. We are a great bar Sierra Vista offering wine and beer. Come for a taste, stay for a drink, bring home a bottle! Only at Hoppin' Grapes Wine and Beer Bar Sierra Vista.